It’s no understatement that industries are undergoing drastic disruptions as of this moment. With cloud adoption rates at their all-time highs and a positive reception for AI and accompanying tech, the demand for more options for collaboration is getting higher and higher. 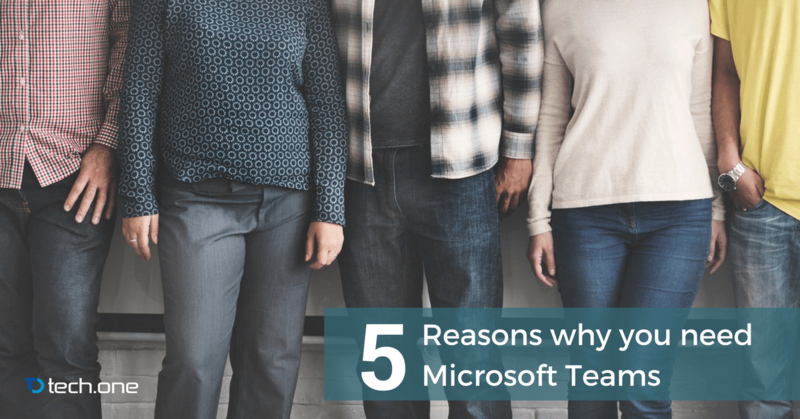 Microsoft is aware of today’s challenges and is now attempting to address the need with its revolutionary Microsoft Teams. According to Computerworld, Microsoft Teams will play a pivotal role in developing a more collaborative workplace this 2018. Today, let’s look at how Microsoft’s main collaboration platform will change workplaces across the world. Collaboration was always about one thing: sharing. It’s not just the ability to process documents from person-to-person — it’s the holistic process of passing ideas and nurturing them through a group of people. Microsoft Teams embraces this way of thinking and gives users many tools and options to cultivate their ideas through collaboration. First, there’s the option to make multiple teams with different channels to cater to different groups and projects. Second, Teams is now developing its screen sharing capabilities which further complements its ability to be a platform for sharing ideas. In a digitally disrupted world, having a team mate’s assistance with a few taps is just what everybody needs to survive the wave after wave of innovations. The key Microsoft experience is defined by the seamless integration between empowering tools. Microsoft Teams, along with the whole Office 365 family of apps, is the ultimate toolbox for every employee living in a digitally disrupted world. Microsoft Office is a well-established brand and has been the sole platform of office tools that powered all companies ever since its creation. By integrating with Teams and Office Online for on-the-go co-authorship, Teams is at a strong position to serve as the go-to platform for producing, managing, and launching content across organizations. Microsoft Teams is not just a platform for sending messages but also for sharing and saving content. You can directly upload specific files to a group and allow team members to edit the file in real time. Aside from that, a user can also save key messages sent in teams for future references. These two options alone are enough to put Teams in a position where it can serve as your personal think tank and notebook. We don’t even have to go too far: Tech One Global itself is utilizing Teams as a platform for sharing and developing content ideas across its teams in marketing, sales, and admin. We believe in the power of sharing ideas and cultivating them into outputs beyond individual imagination. Microsoft Teams and other Microsoft products are not a one-time buy. These are services that continuously receive updates to allow users to adapt through time. It might seem trivial at a glance but the ability to continuously develop is one of the key traits that every IT solution should have. Microsoft Teams and Office 365 is no different: supported by Microsoft’s very own team of brilliant developers and a healthy ecosystem for innovation, you can rest assured that an investment for collaboration platforms will result into huge ROIs. If you’re still skeptical about it, Tech One Global is here to help you succeed in your journey for a better and healthier business communication. For more news Microsoft and Tech, stay tuned to Tech One Global. We are here to empower you and prepare you for more digital disruptions. Digital Transformation: Where do humans belong? Cybersecurity and IoT: What aspect of security is your biggest concern?